Bolzano Salami Garganelli and My Library. 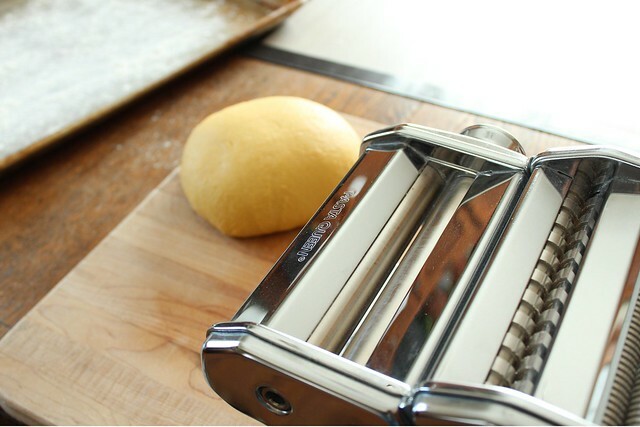 The inspiration for this quick, pan made pasta came started with my obsession with serial reading of cookbooks. I may only read 2 or 3 novels a year, but I swear, I read at least a hundred cookbooks front to back. That includes recipe texts as well... since you never can tell when some little bit of wording will prove inspirational at a later time. I feel like I can never say enough good things about our library systems here in Wisconsin. It was the same when I lived rurally, and I could still get my hands on tons of materials that the little one-room local library couldn't possibly house. Interlibrary loans stretched far and wide and were made through the librarian, linking our small communities with (the "big" city of) LaCrosse, by dropping off weekly shipments. In those days, I renewed by phone since I had no computer. In not so much time, so much has changed. My city has a huge library, and our outlying areas all under the Milwaukee County umbrella have access to the enormous wealth of (in my case) cooking materials. Every few weeks, I am my own librarian and scour the new materials online, placing requests and eagerly anticipating new arrivals. That is nothing to be said of my library branch's uncanny ability to consistently choose great titles across the broad genre of food writing to include in a collection that is literally steps from my house. Some books (the ones I should actually break down and purchase) call their permanent home the library - even though half the year might be spent on the shelf in my kitchen. I never want to take this for granted. In the not so distant past, when I felt completely drained of monetary income, I had the wealth of books to sustain me. Sure, if I had the space and income I would buy every book that strikes my fancy... but when faced with hard economic decisions, the library was my best friend and made me feel overwhelmingly better when things looked pretty bleak. On the new shelf a few weeks back, I found a book by Max and Eli Sussman, brother-cooks from New York City who favor fairly straightforward, uncomplicated foods with big flavors. When reading through, I paused at their pasta-making: Jewish guys that benefited from restaurant kitchen Italians teaching them about elusive pasta dough. After reading that paragraph one Monday morning at breakfast, I was absolutely compelled to make the dough they recommended - one that used some semolina flour and some all purpose, and more eggs than I've ever squished into pasta dough before. 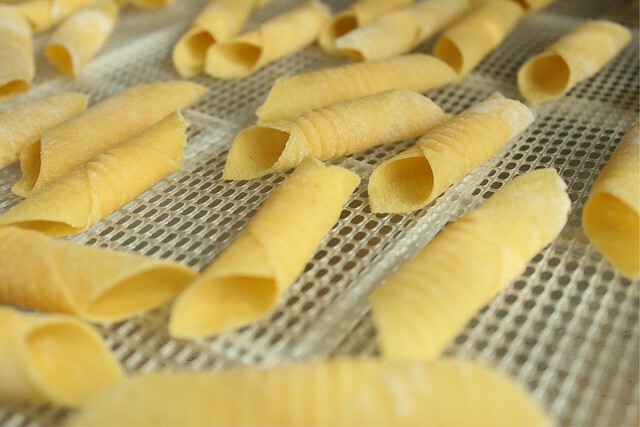 Also in the pasta section of the book were instructions for making the garganelli shape. I'd never heard of that, kind of a poor man's penne. Rich man's penne actually, since the flavor of that pasta was unequaled to any pasta I've made (or eaten) to date. I dehydrated my formed pasta for several hours until brittle, and stored in canning jars. I had "two quarts" of garganelli and one sheet pan full of ribbony fettuccine to remind me of the Sussman brothers and the shear power of library inspiration. While forming the somewhat tedious shells around the base of a wooden spoon, I began to think about the Bolzano salami that I needed to make a second (post-able) recipe with. 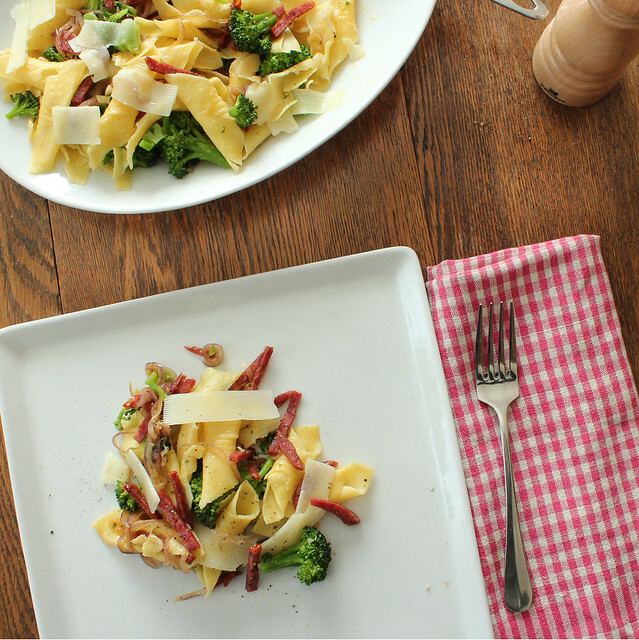 There could be nothing much more fitting than paring rich homemade pasta with similarly rich artisan salami. I added a bit of broccoli for green healthfulness, and a not much more to make one of the most satisfying lunches. 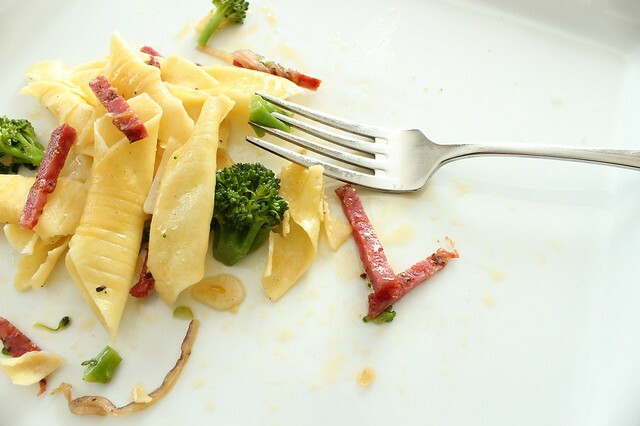 It takes longer to clean up after yourself than to throw this pasta together. Cook the pasta according to package directions in well salted water. 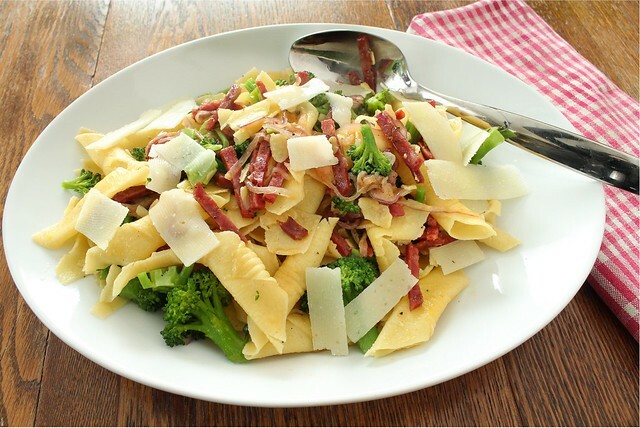 (If using homemade dried pasta, it will cook in 3-4 minutes.) Drain the pasta and have it ready nearby before continuing. Reserve a bit of the cooking water just in case you need to add moisture later. At the same time, steam broccoli until just tender. Film a 12” skillet with the olive oil and add the sliced garlic. Heat over medium high heat until the garlic begins to sizzle, and then add the salami. Sauté until the salami begins to release some of its oil and begins to brown, about 2 minutes. Then add the onion and sauté until the onion is just wilted, about 1 minute. Quickly add the broccoli, stirring just to incorporate. Finally, remove from the heat and add the pasta, tossing gently to coat everything well. (If the pasta seems dry, add a bit of the reserved pasta cooking water.) Season well with black pepper, and garnish the platter (or servings) with the shaved pecorino cheese. Add flake salt at the table if needed. In their book, the Sussman brothers had a recipe for using their homemade garganelli pasta, a tomato based sauce with pancetta if I remember right. Maybe their suggestion rubbed off on me. All I know is that if you fry Bolzano salami in really good olive oil, you could have the base for any number of really delicious things. Things that are really simple and uncomplicated, things that don't cost a lot of money but make you appreciate grandeur of a simple life spent mostly at home. Lori and Paul from Burp! Disclaimer: Like the Salami Shakshuka I posted about earlier this week, I did receive this salami free of charge in exchange for writing a couple of recipes and promoting our local man, Scott Baur. Of course, all opinions about Bolzano salami are my own. Having already sampled other Bolzano products, and also having some familiarity with his local commitments to excellence in slow food, I knew I would have nothing to say but complementary things! If you are looking for "Something Special from Wisconsin", look no further!